Loco is an Eastern Gray Squirrel that came to Wildside in November of 2018. He was brought in by a family that had found him as a baby and tried to make him a pet. Obviously, because Loco is at Wildside, that was not a great idea. He began to get a bit out of control for them, which can happen with wild animals. Loco was just being his normal self! Thank goodness this family brought him in. It was too cold outside to release him in the wild so he has residence in large cage where he can run around in his crazy way…this is how he got his name! Loco will be released near Wildside when the weather is warm enough for him to survive. He will have plenty of squirrels to hang out with in the area. Eastern Gray Squirrels reside all over Michigan. They come in a variety of shades, gray to black. Eastern grays eat nuts, seeds, buds, and flowers of trees. Like other tree squirrels, the eastern gray plays an important role in seed dispersal. Have you ever seen a squirrel burying things in your yard? They are burying seeds and nuts when winter approaches. They bury more than they can eat. The remaining seeds/nuts will sprout and grow when spring arrives. Eastern grays have an excellent sense of smell, which they use to help locate food that they’ve hidden away. They can also pick up information about other squirrels by smelling them. Or in Loco’s case, humans! Have you ever seen a squirrel flicking its tail or chattering? This is the way they communicate with each other. They have one sound that alerts other squirrels if a predator, like a red fox or red-tailed hawk, is near. Ever wonder what those balls of leaves are up high in a tree? That is the nest or den for this squirrel for raising their young. It is made up of leaves and twigs. The eastern gray can also use cavities in trees to make their home. Females can begin to have kits as young as 5 ½ months. They usually have 1 to 2 litters a year that each consist of 2 to 4 babies. 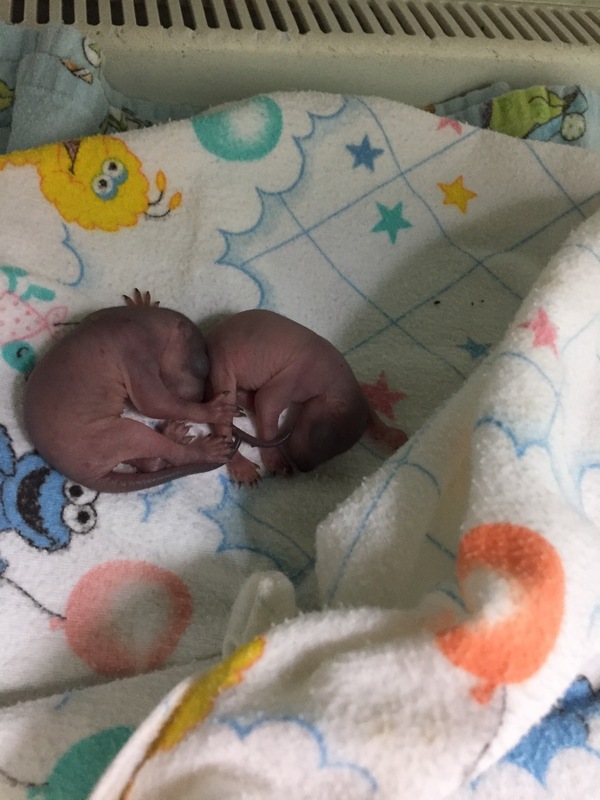 The babies are born blind and hairless! They may weigh as little as one half of an ounce! When they are 10 to 12 weeks old, they will begin to leave the nest. They are full grown at 9 months. Baby Eastern Gray Squirrel drinking formula from a syringe. I wanted to update everyone on the numbers from 2018….we admitted 1623 animals into rehab, more than any year previously. We had over 9100 hours of volunteer service, also more than any other year. We are a non profit 501(c)3 and have no outside funding sources. We rely on donations to buy food, formulas, medical supplies/medication, provide veterinary care and build enclosures. When our animal count rises, so do our costs. Last year, our electric bill alone was over $9000 for the year, our veterinary bill was over $2000. 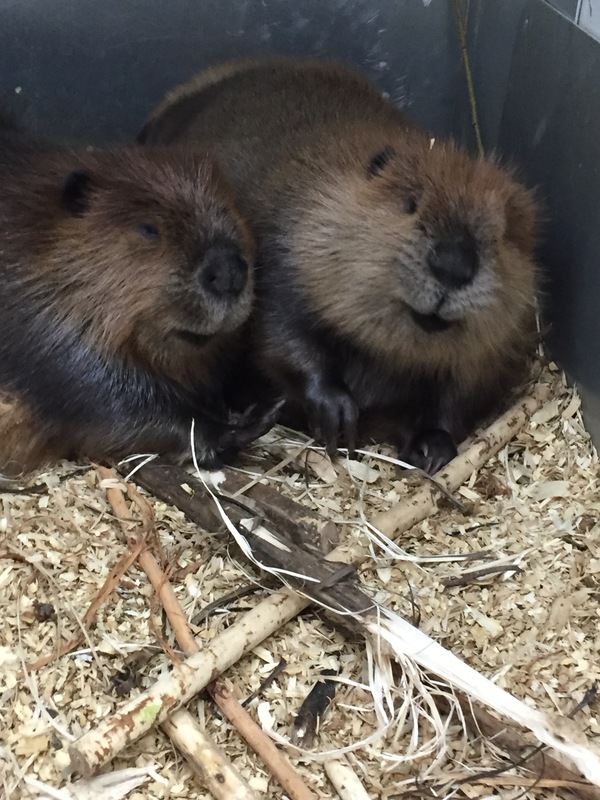 The cost of filter sand replacement for the beaver habitat is over $2400 for the year. We recently had the pump house, which houses the beaver habitat filters, insulated to help keep the cost of heating it down. We are trying to keep our costs down by replacing older fluorescent lighting fixtures with new LED fixtures. We are considering some solar options but the initial cost is high. I wanted to let our donors know that we appreciate their continued support and to please spread the word about the work that WILDSIDE does. Become a volunteer! See the volunteer page for more information. Donate! Monetary donations help us the most. then we can target the money for the immediate needs. When you shop on Amazon, go to Smile.Amazon and designate WILDSIDE as your charity. Each year, we admit birds or mammals that are uncommon species at Wildside. This year has been no exception. We had the privilege of raising a baby Common Loon! She was found in Lakeview, MI. Her parents were not caring for her, she washed up on shore and was rescued by a kind couple who were vacationing there from another state. We were able to meet them in Ionia to pick up the baby loon. Toons, as she became known, was immediately loved by all. She readily ate small fish in the tub and soon moved to a pool in the yard. She began to loose her fluff and get real feathers…her appetite also grew! Once she was older and had feathers, we decided the beaver habitat pond would be a great place for her during the day while the beavers were sleeping. This worked great, until one day the beavers decided to wake up early and take a swim! Toons swam, dove and made a lot of noise, but once she settled down, she realized that she could inhabit the pond with the beavers! We knew release needed to come soon for Toons and although we would be sad to see her go that was why we raised her (or so we thought)! Lakeview, where Toons had been born was chosen as her release site. Mom, dad and I spent 2 hours driving to find the site. Once there, we met a couple that was taking their boat out on the lake to go fishing. We told them about what we were doing and I gave them my business card (thank goodness)! Toons was set free on the lake. Even though the breeze was cold that day, we stayed and watched her for over an hour to be sure she would be ok. We left to eat lunch and then returned to find her out by lily pads, where fish like to hide, and we felt comfortable to then leave her. I thought about her daily and desperately wanted to check on her, but the 2 hour drive was making that impossible. Then, the phone call came 5 days after her release. She had been following a couple who was fishing and had eaten a fish with a hook in it. I was devastated, afraid we had lost her for sure. After talking with the woman on the phone, she and her husband, who had caught her but released her, were willing to go back out to see if they could catch Toons again. The long 30 minutes of waiting began. Even though we had no idea if they would be successful, we headed out, driving toward Lakeview. The call came and they had her! We met them in Sheridan, just north of Ionia. The whole time believing this was the same couple I had given my business card to 5 days earlier. Once we met at the gas station, I realized that it was not the couple I thought it was. The couple I had given my card to had been fishing the same time as the husband and wife that had found Toons following them. It was a twist of fate that it all fell into place to allow Toons to come back into our care. The next big dilemma was the hook she had swallowed. The x-ray clearly showed the hook and we were hoping she would pass it…which she eventually did. She has not left us since and we now realize she is too friendly to release back into the wild. Toons will have a permanent home at Tracy Aviary in Utah. She will be flown (yes, on a plane) to Salt Lake City, Utah soon. We will miss her gentleness and her antics in the pond; diving, flapping and eating fish…among the beavers! 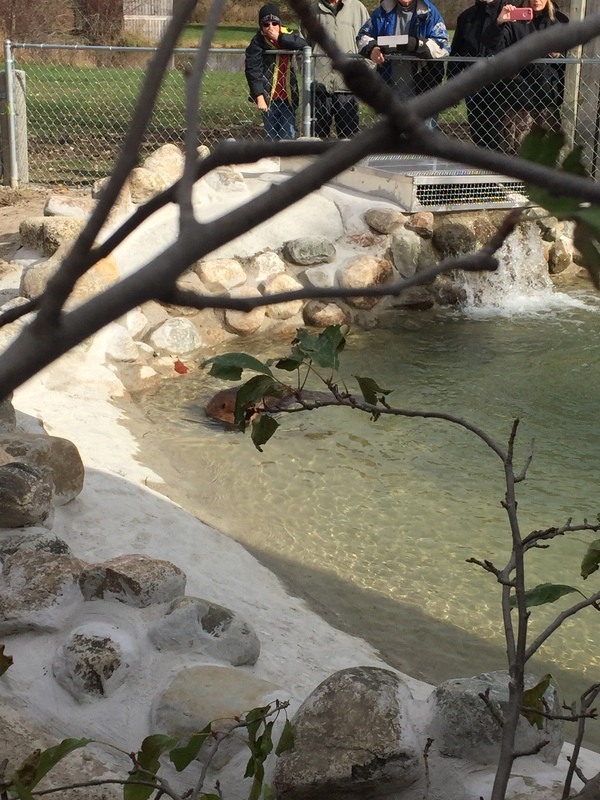 The Paddle Brook Beaver Habitat officially opened on November 11, 2017. 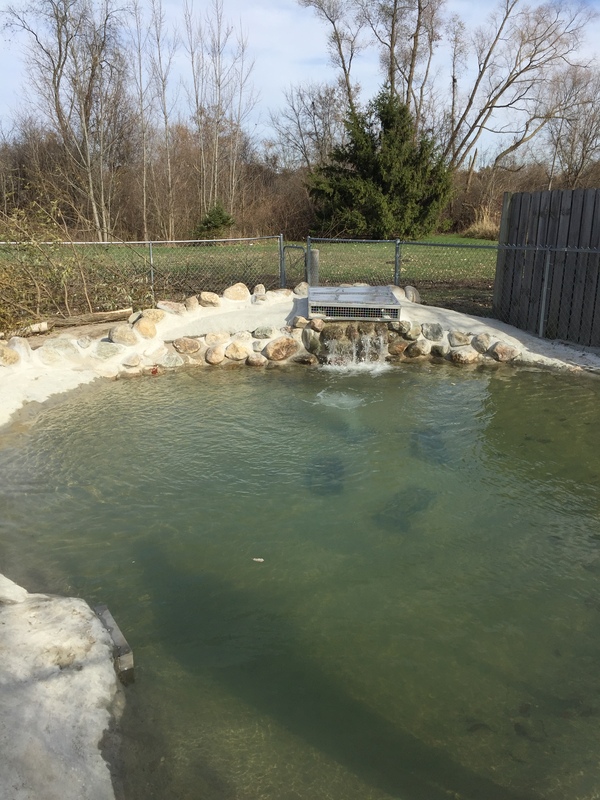 Named after our educational beaver, Paddle Brook, who passed away many years ago, the habitat has a 24 ft x 16 ft x 4 ft deep pond with a waterfall at one end. A “Porta-Hut” is used for the beaver’s lodge with pine shavings and plenty of branches that they have been dragging in to chip and shred for their own bedding. 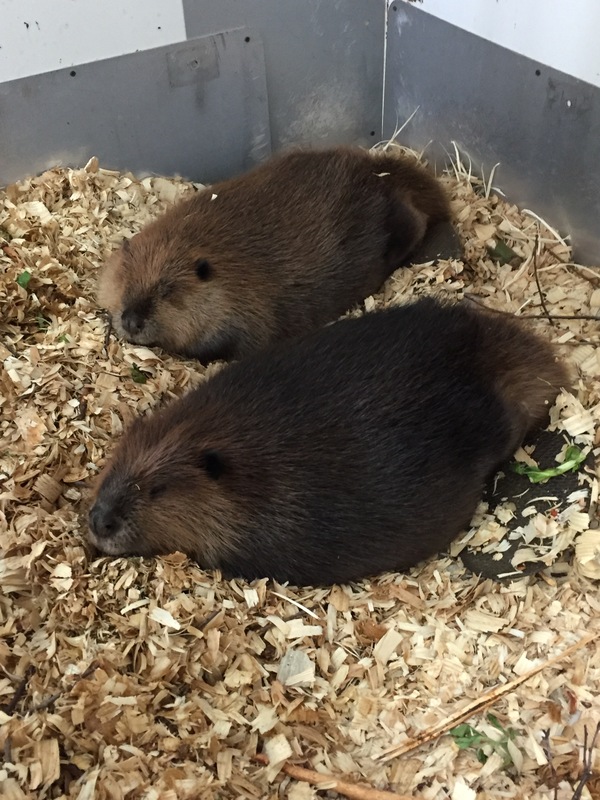 Molly and Patrick, the year and a half old beavers, love their new space and spend hours in the pond swimming, dragging and eating branches and exploring their area. We continue to need fresh wood such as aspen, willow, birch, apple, cherry. The wood has to be free of herbicides and pesticides and hand cut so as not to have chain saw oil on it. We are still working on the filters and hope for completion of that system in the spring. We are concerned about the costs associated with the completion of the filtering system and the operation and maintenance of the habitat. Any further donations for the beavers will go toward those expenses. 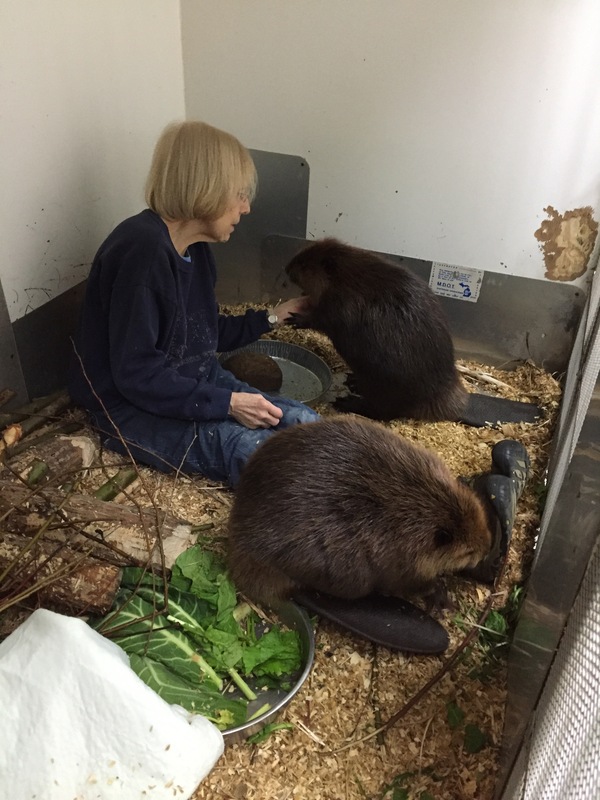 Molly, Patrick and baby Bella, the 6 month old beaver, consume between $80-$100.00 of greens and vegetables per week(dandelion leaves, leaf lettuce, collard, beet leaves, spinach, red chard, broccoli, carrots, beets, sweet potatoes, spinach and celery). So extra funds will also help us with that cost. Thank you to everyone who has given to this project, we look forward to many years of being able to appropriately rehabilitate this important wildlife species. This young beaver was caught in a leg hold snare trap and left to die a slow, painful death. Stephanie was jogging by and could see he was in pain and not able to free himself. So she called WILDSIDE. A nearby land owner and a DNR Conservation Officer managed to cut him free but he had to be transported with the trap still on his foot to us. 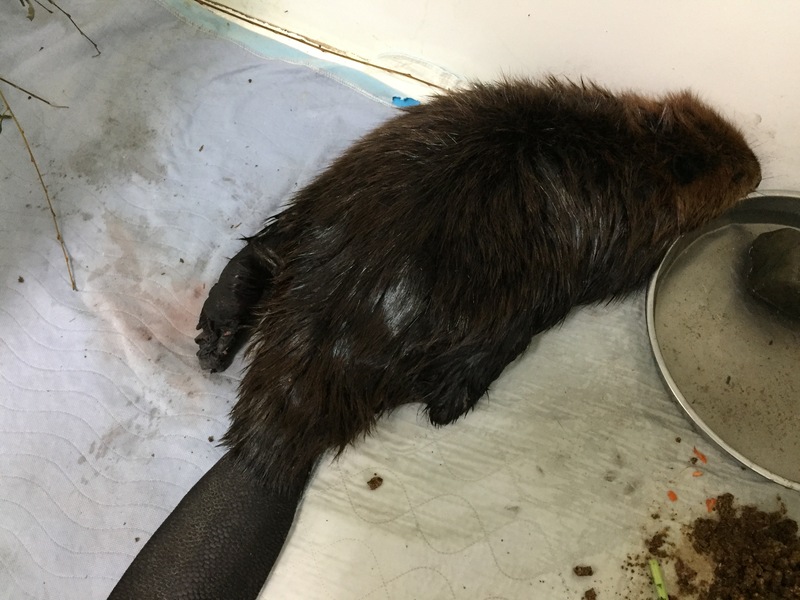 With your donations, this young beaver will make a full recovery after having had x-rays and wound care that was quite extensive due to the trap injuries. 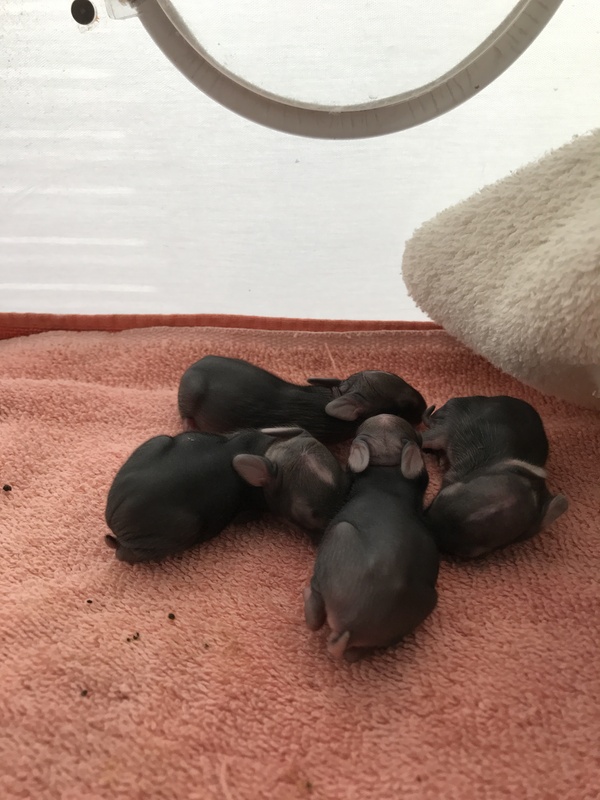 As we begin yet another spring at Wildside, it is important to remember about all of the baby animals you may come into contact with that may or may not need your help! Some general recommendations are below, but see Wildlife Emergencies fore more information! Call WILDSIDE for assistance at 517-663-6153. Use a heating pad on low under the box you have contained the mammal in. You can pour rice into a sock and tie off the sock. Heat that in the microwave fo r a minute and a half. It is important that the baby be able to move away from the heat source. For smaller mammal species, a secure box small or a smaller cat carrier will do with a small box inside it. For larger mammal species, use a larger box or pet carrier with t-shirts on the bottom. Put air holes in the box before you put the baby inside. Place the container in a room away from all household activity (pets, children, etc.). Prevent the possible transmission of parasites or disease by not letting children handle wild animals or letting them near pets. Do not forget to continue to provide supplemental heat during transport to a licensed wildlife rehabilitator. Do not try to feed any animal you find. There are special formulas made specifically for wild animals. Human baby milk, or cow’s milk can kill a wild animal. For injured animals, a box or carrier in a quiet place is best until the animal can be transported to WILDSIDE. 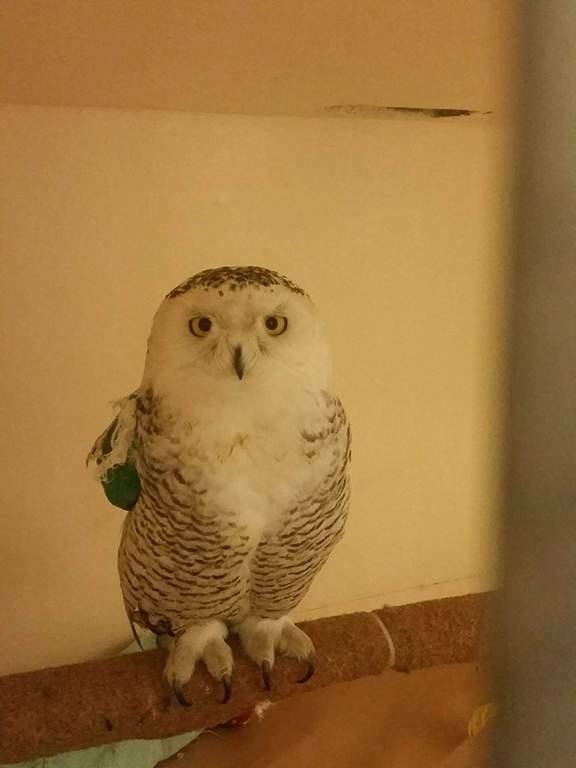 This injured Snowy Owl was hit by a semi near Grand Rapids. She has a fractured wing that will hopefully heal well so that she can be released. DO provide supplemental warmth as explained. 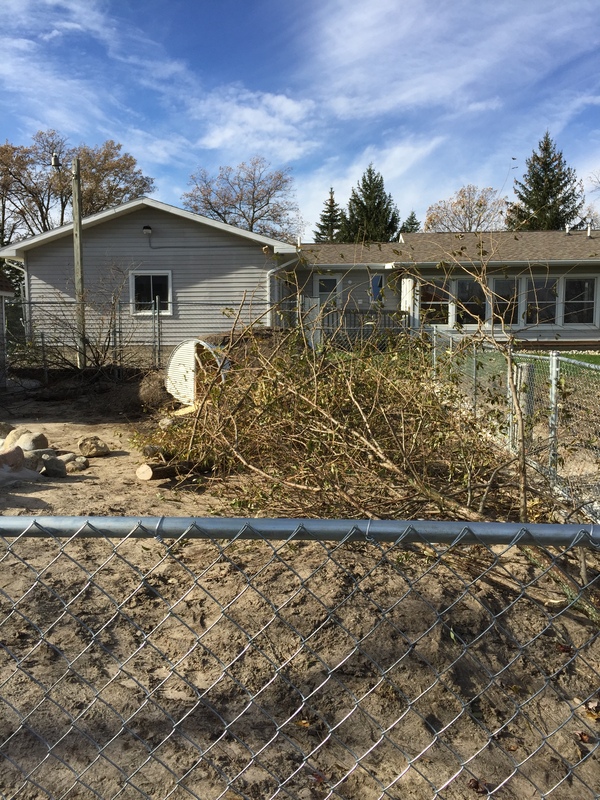 Call a licensed wildlife rehabilitator: WILDSIDE Rehabilitation Center, 517-663-6153, Eaton Rapids. Wildlife parents DO NOT abandon babies that have been handled by humans. They just lick off our scent. Transport all orphaned, injured or ill mammals to a rehabilitator as soon as possible.